When I was 12 years old, I connected with a neighbor who turned out to be a very influential friend and mentor. I was fortunate to have this amazing horse(wo)man help me sort out countless problems with my first horse. Gypsy was a 14 hand step-up from my pony, and at 10 years old was “green broke” and had more issues than you could count. I didn’t have a set of wheels (truck and trailer) back then but with my mentor’s help, I was able to prepare my mare to show at the county fair, AND hitch a ride to get there. But we didn’t just enter the speed events – she encouraged me to learn about AND enter. every. single. class. 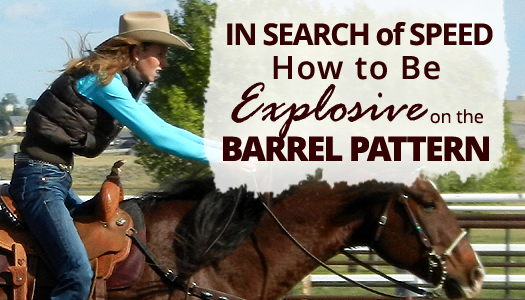 Do you ever get frustrated because you can’t seem to carve out enough time to FULLY apply yourself to your barrel racing? Ever feel like you’re short on funds, but you have to WORK to make money – which takes up TIME, AND takes you away from your horses? Not to mention ALL the other life responsibilities you have outside of work and riding? 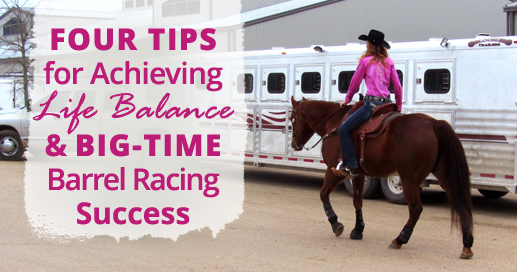 Here’s the honest truth – it requires a significant amount of TIME, FOCUS and FINANCES to climb high on the ladder of barrel racing success. But don’t let that discourage you, let it MOTIVATE you. First though, a reality check is in order. 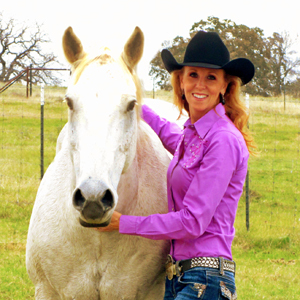 So is owning and maintaining a horse property, so is being a student, a wife, and a mother. So is just caring for horses and other critters. They are ALL full-time jobs in and of themselves. So it’s NO WONDER we’re overwhelmed and struggle to balance it all. We’re trying to do TOO MUCH – the impossible, really! 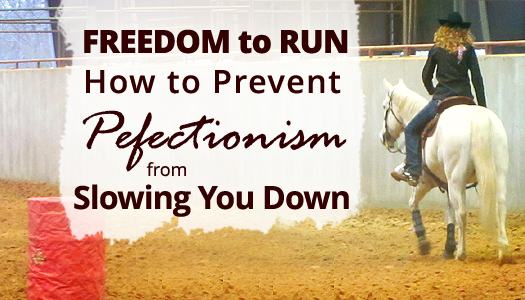 A new barrel racing season is under way and “inner perfectionists” everywhere (who may have been laying low throughout the winter months) are rearing their ugly heads! No, it ain’t pretty. And when it happens, our riding sessions and our runs aren’t likely to be either. Unfortunately, the damaging effects of having unrealistically high expectations of ourselves and our horses go well beyond the arena. It’s not that being a perfectionist is necessarily a bad thing, but it’s easy to take it too far. If you can relate to any of the statements below, you might be a perfectionist. You suffer from “paralysis by analysis” and hesitate, question or second-guess yourself. You ride just a little bit different in public then you do at home. You compare yourself and your achievements to other barrel racers. You prefer to ride alone verses in a group. You’re either quick to point out your flaws, OR you rarely, if ever admit to them. You get extremely nervous before a run. Thoughts of what you said, did, or how you performed consume your mind. Your riding at speed lacks fluidity; having good timing is challenging. You make assumptions about what other people think of you, assuming it’s negative. Competition triggers an unexpected and unpleasant roller coaster of emotions. You expect a lot from your horses and tend to over work, train or drill them. You put unrealistically high demands on yourself to perform well. You have a hard time receiving criticism or get emotional when you do. Sometimes you find it hard to find the motivation to really focus on your barrel racing. You’d rather avoid situations where you’re the central focus of other people’s attention. 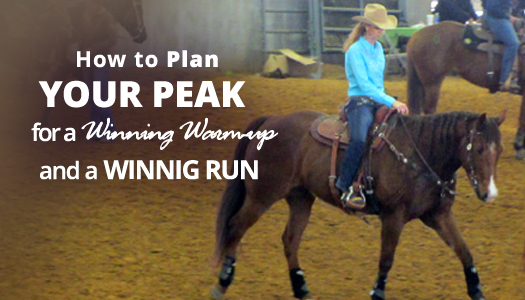 You safety up or hesitate to “leave it all in the arena” in a competitive run. You find preparing yourself and your horse for competition to be stressful. 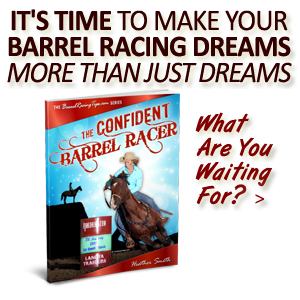 You’ve been working hard for years, but still haven’t achieved your barrel racing goals. You know something’s wrong after checking in to an extended stay hotel, and your grocery list includes fly fogger, ant bait, 409, and bleach. No, chasing your dreams ain’t all sunshine and rainbows. Sometimes there’s dirt, grime, bugs, or worse! In my case, I had to scrub, scrub, scrub just to make my husband and I’s hotel room livable when we arrived to Texas last year. 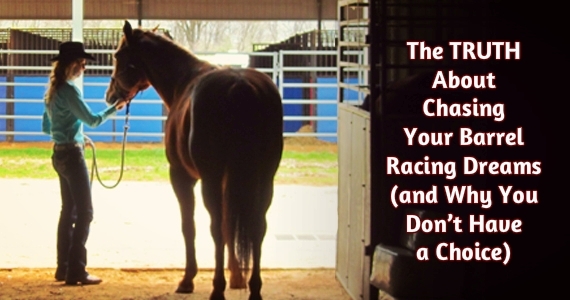 In honor of the completion of my second book, today’s post is one I resurrected from the email archives to share the lessons gained during our cross country move, including similar insights that seem to be occurring all over again recently, in hopes that they will serve you as you make YOUR barrel racing dreams come true! We began our incredible voyage on February 7th, 2013 when we left frigid Wyoming in the rear view, and with a caravan including a rig with three head of horses, an affectionate Aussie riding shotgun, and another rig with a Pontiac on a flatbed, we headed south – to stay. Not all, but most weekend warrior barrel racers would love to ride, train, travel and compete full time, if only… they had the right horse, more money, etc. 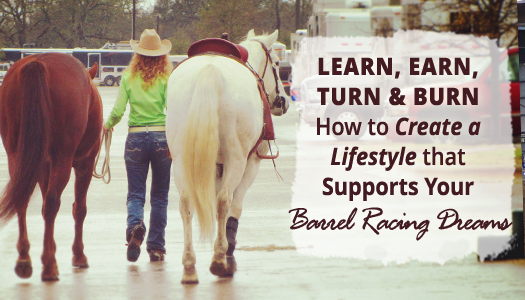 Today’s post was written to remind YOU that the barrel racing lifestyle you’ve always dreamed about IS indeed possible, AND more readily achievable than you might think. SPEED. 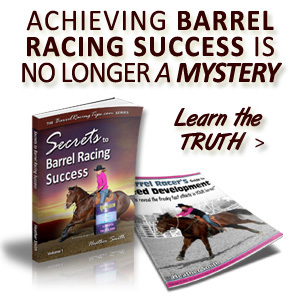 We breed for it, we condition for it, we train for it, we feed for it, yet getting the most of it that we can from our barrel horses remains, on many levels – a mystery. Today I’ll be sharing some interesting observations I’ve made about speed, and unconventional tips for creating it, especially when all other avenues have been exhausted. 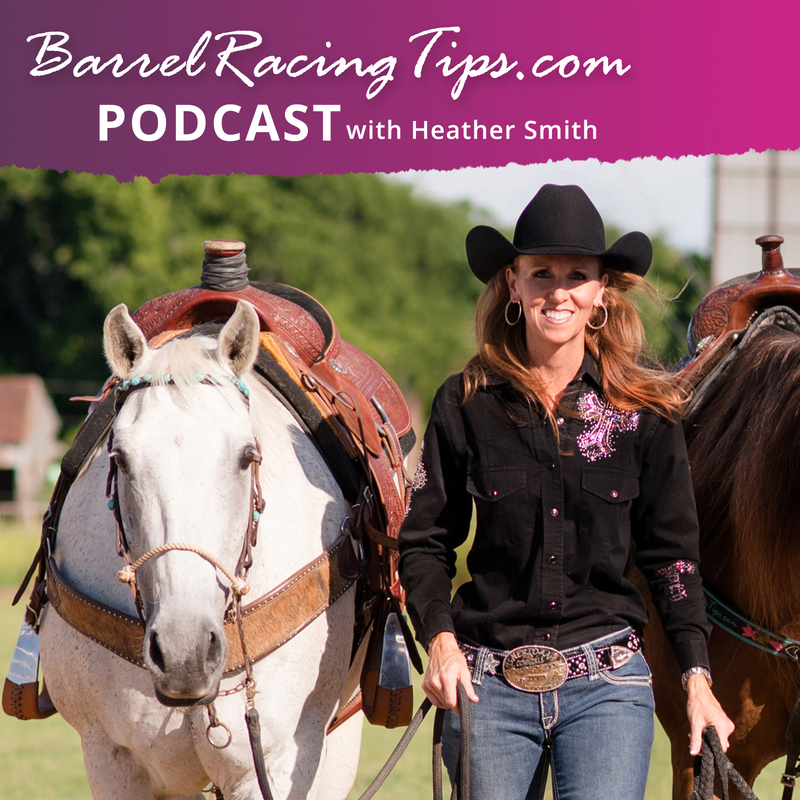 https://www.barrelracingtips.com/wp-content/uploads/2018/06/barrelracingtips.png 0 0 Heather Smith https://www.barrelracingtips.com/wp-content/uploads/2018/06/barrelracingtips.png Heather Smith2014-04-01 01:00:082018-09-08 23:42:35In Search of SPEED - How to BE Explosive on the Barrel Pattern! One of the most important things I learned as we worked toward our goals at liberty, was if I did something to destroy Dot Com’s interest in sticking around, I had nothing. It was obvious when it happened (even to the neighbors), due to the 1,100 lb. white streak flying across the pasture – whoops! We tried not to practice that habit. When working in a round pen, a horse that loses connection will tend to look to the outside of the circle – a sign that they are checked out mentally, and wishing they were somewhere else. An extremely distracted horse at liberty isn’t quite ready to be turned loose, but would benefit from developing more positive habits online first. No matter where I work my horses, or what tools I happen to be using, I want to develop them in a way that encourages them to choose to focus on me, despite any environmental distractions. One of the biggest mistakes I made with Dot Com was squashing his genuine desire to be with me by applying too much pressure, and expecting too much, for too long. At liberty, that desire to connect is like GOLD, and I wasn’t doing enough to preserve it. As intense as the horse’s attention span must be at liberty, you can imagine it’s easy to burn a horse out quickly. Shorter sessions, with plenty of releases and relaxation time in between the more intense lessons, was what it took to keep Dot Com interested in the conversation – a lesson that no doubt applies under saddle as well. The tricky part, was that a sensitive horse like Dot Com can actually check out mentally without ever leaving physically. They can even check out while working online or when ridden, without running into and putting any pressure on the rope or reins. I learned how to recognize the truth of how he was feeling through reading his expression. 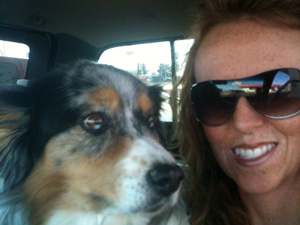 I learned not to barge through the worried ears, or his blank, hard, empty stare, and how to reward and recognize the soft eye and relaxed muzzle as my green light to proceed. The horse’s body language and expression will provide a map telling you which way to go, but only if you pay attention, realize its importance, and learn how to read it. When he did choose to leave me, it was always a sign that I needed to slow down, get back online, or work in a smaller space to rebuild the connection that was lost. Horses learn bad habits so quickly. 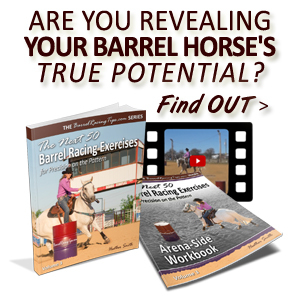 One of the major sources of problems in the barrel racing world comes when a horse has learned he can successfully push through pressure. What gets rewarded, gets repeated. By running away, Dot Com was finding a few moments of peace by avoiding me. We’d all be better barrel racers if we were more careful not to allow any undesirable behavior repeat itself. We must look at what happened, before what happened, happened to cause it in the first place – and make any necessary adjustments immediately. So often we don’t realize that our horses are running away mentally. Thanks to my time with Dot Com, I’m more aware of what that looks like and how I can prevent it, both on the ground and under saddle. Again, this is where becoming a true horseman comes in. The lesson here is to always be thinking about how you can do more with less, yet always have a safety net, so that you don’t set your horse up to fail before he’s thoroughly prepared. There are usually many signs that our horse is a goner before the really obvious signs come up, but we have to be horseman enough to notice them, and take appropriate action. An important lesson Dot Com learned was how to come toward pressure. With such a small tolerance for pressure of any sort, by default Dot Com would react rather than respond. With time, he learned to tip his nose, and with positive flexion through his body, come in to me when I directed the tiniest amount of pressure toward his hindquarters, even at a distance, and with speed. 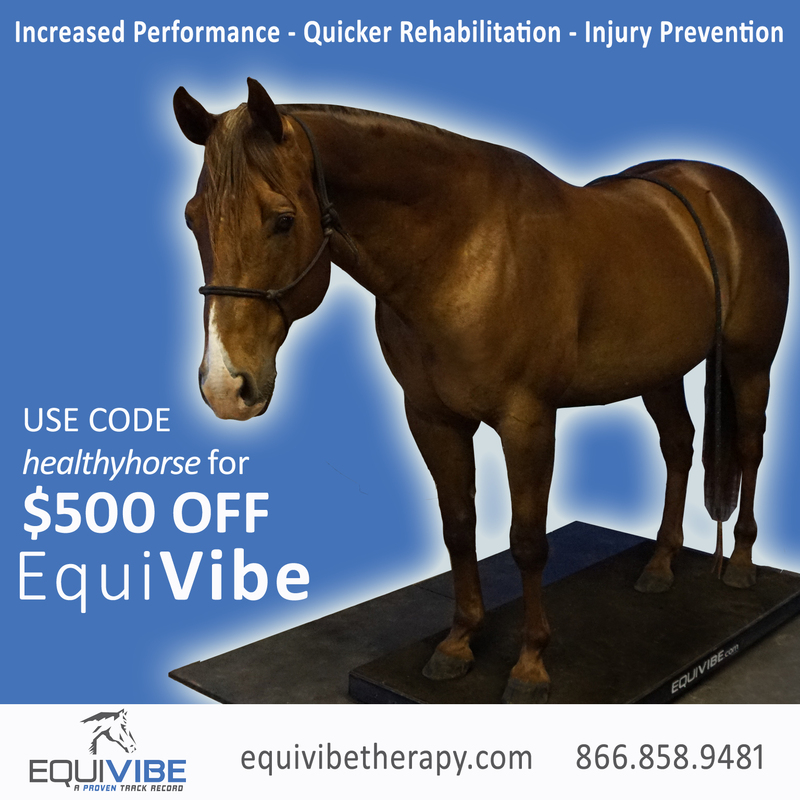 He even learned to walk backwards and sideways toward me when I applied rhythmic pressure from a distance – another huge accomplishment for a horse whose automatic response was “when in doubt, LEAVE (fast)!” Finally, he was thinking, he was learning to respond, yield toward and away from pressure, and not make reactive, rash assumptions. What makes working at liberty so challenging is that not only are you working with a horse with no actual physical connection, but at advanced levels you begin to communicate at greater distances and in bigger spaces. A horse that blows you off at speed under saddle, isn’t much different than one who blows you off at a distance on the ground. One of the building blocks to liberty at distance, was working online at a distance. If Dot Com ignored my request to draw to me or drive away, move sideways, backward, move his body parts around or go up or down in gait from the end of a 45’ line, then chances of it happening from 20’ at liberty were slim. I developed all these things to a very high degree online first – which is no different from how we must develop our barrel horses well going slow, if their education and responsiveness is to hold up going fast. Of course we did add speed to our liberty work as well, which was part of achieving our goal of performing flying lead changes. Although I used the delicate, low wall of a round pen built with unelectrified tape as a support, flying lead changes meant that I would need to rev him up while maintaining a high, even level of drive, draw AND general responsiveness. For a horse that tends to get emotional as speed increases, it was no small feat. 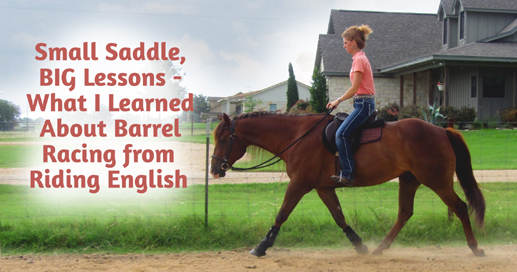 Helping him through this meant brushing up the individual ingredients for the maneuver, as well as plenty of building up and slowing down, building up and slowing down, in order to close the gap between speed and relaxation – no different than what we must do with our barrel horses. I also lavishly rewarded him when he did turn and come toward me, which simply consisted of a good rest – free of any and all pressure. As we progressed, he became more and more confident about placing his feet. He learned how to position his body appropriately for the lead changes and was responding to me lighting fast without zoning me out, breaking gait or breaking the connection. It’s not just speed that causes horses to be emotional, it’s the pressure of having to arrange their feet very precisely under our direction. After all, surrendering control of their feet goes against all their instincts. Don’t ever take a horse’s complete willingness for you to guide their feet, especially at speed, for granted. The greatest compliment they can give you – is their trust! For a horse like Dot Com who is not very confident by nature, it’s no wonder that precisely placing his feet in the roping box, combined with the emotional anticipation of high pressure and speed, created anxiety. I’m certain that by developing calm, quick responsiveness at liberty, that we are a huge step ahead in creating it when my husband can offer him even more guidance and support under saddle. 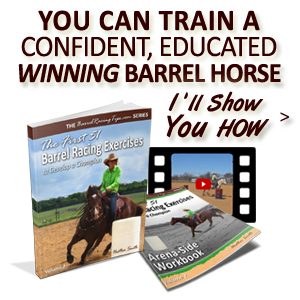 Would you like to build more connection with your barrel horse? How to Start Your Rides and Runs Right!